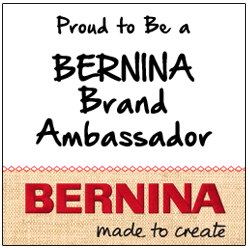 I am happy and thrilled to report that I've become a new BERNINA Ambassador! This is the distance between the needle and the side of the machine. Oooohhh wee...it sews like a dream! The machine is completely computerized. It has all kinds of bells and whistles that I've yet to discover. I start taking classes next week to learn all about it. In the meantime she will be getting a work out sewing all of my projects with a June 1st deadline! Better get moving! Congratulations what a great opportunity for you. Looking forward to see what comes off this high tech machine! Congratulations! Will be interesting to see what you show us! WElcome to this awesome BERNINA club Jamie! So proud to be in your company. We'll finally get to meet someday, right??? Love and huggs!